Much research has shown that protein malnutrition can have a variety of untoward effects on the immune system. In fact, protein malnutrition may be an important contributing factor in HIV seroconversion (the process by which a person with primary exposure to Human Immunodeficiency Virus becomes infected with that virus). Research studies have show that deficiency of high-quality protein protein can result in depletion of immune cells, inability of the body to make antibodies, and other immune-related problems. In addition, animal studies have shown that the immune system can be significantly compromised with even a 25% reduction in adequate protein intake. Therefore, a diet that supports a healthy immune system should contain foods providing high-quality, complete protein, such as that found in eggs, fish, shellfish, and venison. Many vegetables and grains are also excellent sources of many of the immune-stimulating amino acids and, together with other protein sources, are particularly beneficial. The recipes on this web page provide many excellent menus for a meal with complete protein, such as the Baked Seafood with Asparagus, or Poached Fish with Chinese Cabbage. As discussed above, your body uses a variety of responses to maintain its defense against harmful pathogenic organisms in the environment; therefore, it may not be surprising that nearly all of the vitamins are necessary to maintain and promote some aspect of your immune function. Some vitamins have received more attention in the research literature since they are particularly important to a healthy immune system. Much has been written about the role of vitamin C in supporting the immune system, in part because it has been promoted as an immune stimulant by the noted scientist and Nobel Prize Laureate, Linus Pauling. Vitamin C appears to support a decrease in the length of time and severity of symptoms associated with upper respiratory viral infections, promote phagocytic cell functions, and support healthy T-cell function. Vitamin C also provides antioxidant activity to support healing at sites of inflammation. An excellent source of vitamin C is citrus fruit. Many vegetables are also excellent sources of vitamin C, such as fresh parsley, raw cauliflower, mustard greens andRomaine lettuce. Many of the B-vitamins are also very important in supporting a healthy immune system. For example, vitamin B5 (pantothenic acid) promotes the production and release of antibodies from B-cells, and deficiency of vitamin B5 results in reduced levels of circulating antibodies. Folic acid deficiency leads to a decrease in T-cells and can result in reduced effectiveness of the soluble factors as well. Vitamin B6 deficiency consistently impairs T-cell functioning and results in a decrease in blood lymphocyte counts. Deficiencies in vitamins B1(thiamin) and B2 (riboflavin) may impair normal antibody response, and low vitamin B12appears to inhibit phagocytic cells and possibly T-cell function. Almost all whole grains, vegetables and fruits can serve as excellent sources of at least some of these vitamins, but some vegetables are particularly beneficial since they are excellent sources of many of these immune-supporting vitamins. In particular, Romaine lettuce is an excellent source of vitamins B1, B2, C, and folate. Cooked turnip greens and boiled spinach are excellent sources of folate, vitamin B6 and vitamin C. And cooked cauliflower is an excellent source of vitamin C and folate and a very good source of vitamin B5 and B6. Raw crimini mushrooms are also an excellent source of vitamin B2 and vitamin B5. Red bell peppers are an excellent source of vitamin B6. Vitamin B12 can be obtained from protein-providing foods such as fish, shellfish, venison and calf’s liver. The fat-soluble vitamins, vitamin A, vitamin E and vitamin K are also important to overall health. Vitamin A deficiency has been shown to impair antibody function and T-cell activity. 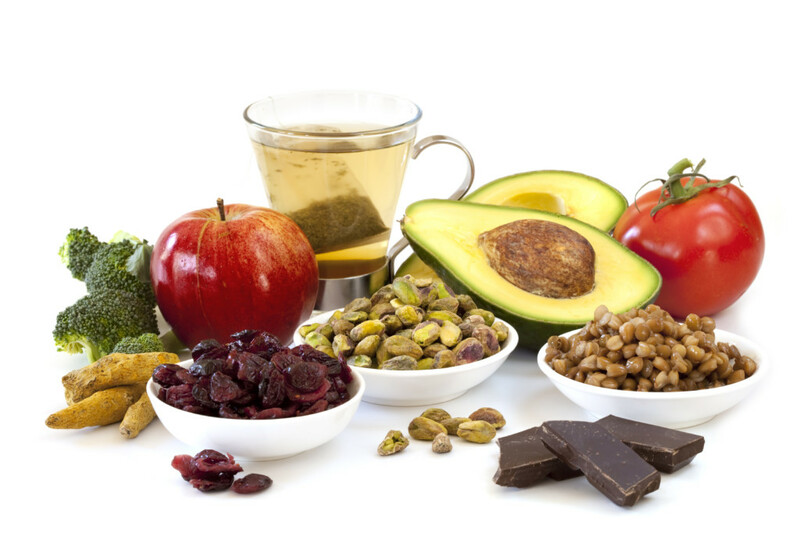 Vitamin E is an important antioxidant and supports a healthy inflammatory response. Vitamin E is also an important component of all cell membranes and promotes healthy cellular functioning overall. T-cells and B-cells from vitamin E-deficient animals show depressed responses, and tumors have been shown to grow faster in vitamin-E deficient animals. Vitamin K supports a healthy blood-clotting ability in your body, and this is necessary for seclusion of areas of infections and injury in the healing process. Cooked turnip greens and boiled mustard greens, mentioned above, are also excellent sources of vitamins E and A, as well as boiled Swiss chard. Other excellent sources of vitamin A include many vegetables such as spinach, freshparsley and carrots. Concentrated sources of vitamin K include raw cauliflower, as well as most green vegetables such asspinach and asparagus. Zinc is one of the minerals in food that has received the most attention for its ability to support immune function. Zinc is a potent immunostimulant, and its deficiency can result in profound suppression of T-cell function. Children with severe zinc deficiencies show signs of growth retardation and susceptibility to infections. However, an excess of zinc has also shown negative effects on immune function and can inhibit the phagocytic cells (macrophages and neutrophils). So, maintaining adequate but not excessive levels of zinc is important. This is one reason food is such an excellent source of obtaining nutrition versus supplementation; food contains a balanced variety of the micronutrients whereas supplementation with individual nutrients can lead to too much of some and not enough of others. Healthy levels of zinc can be provided by including the good sources of zinc, such as boiled Swiss chard,collard greens, and both summer squash and winter squash, or the very good or excellent sources of zinc like lamb, raw crimini mushrooms and calf’s liver in your diet. Many other minerals are important in supporting immune function. Clinical research studies have shown that irondeficiency results in impaired response to antibodies, and defective phagocytic cell functioning. Copper deficiency is associated with an increase in infections and may impair development of immune cells such as T-cells and the phagocytic cells. Selenium and manganese are important for supporting healing from inflammation and may be immunostimulants. Selenium can be obtained from fish and shellfish, as well as tofuand whole grains. Excellent sources of copper are turnip greens,calf’s liver and raw crimini mushrooms, and very good sources include spinach, asparagus and summer squash and boiled Swiss chard. Iron can be provided by fresh parsley, spices such asthyme or cinnamon, tofu, beans and peas, and many other vegetables such as spinach and Romaine lettuce. Reactive oxygen species, free radicals and other damaging molecules are generated at sites of infection and inflammation. Your body needs these molecules at the site of infection to help kill unhealthy cells; however, when your antioxidant systems are not functioning, or when not enough antioxidants are present in your diet, these molecules are not disarmed after they have done their jobs and can become damaging to healthy tissue as well. Many fruits and vegetables provide antioxidants and phytonutrients that help maintain healthy tissue around the sites of infection and support healing. Fruits and vegetables, especially colored foods like strawberries, cherries, carrots, andtomatoes contain many beneficial phytonutrients with antioxidant potential. More detailed information on the health benefits of phytonutrients can be obtained from the FAQ: What is the Special Nutritional Power Found in Fruits and Vegetables.